Get your free copy of Content Strategy For The Pet Industry! Get more traffic, automate your content marketing and strengthen relationships with your customers IN LESS TIME by prioritizing the most effective content marketing strategies. 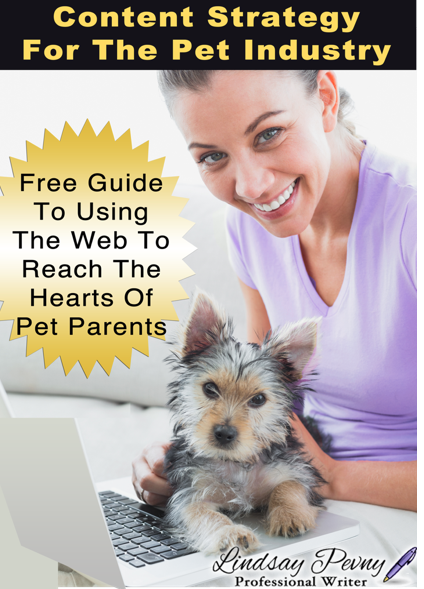 This brief yet powerful guide will help you make the most of your limited time, energy and budget for marketing your pet business on the web. You’ll get a quick scope of what you need (and what you don’t need) to get in front of the right noses and kick-start your website’s traffic, get more leads and attract new customers and fans. To keep you on track, you'll also get access to my 5-day content marketing workshop. You'll get an email each day with actionable advice to get you rolling. Subscribe and get weekly updates from my pet industry blog, plus your free copy of Content Strategy For The Pet Industry.